With the aid of an (old) moving coil instrument it is very little effort to make a simple voltmeter that, at a glance, indicates the status of a telephone line. 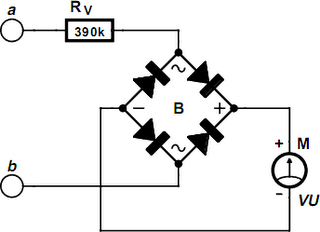 Because the input impedance of this circuit is very high, there is no problem in having it permanently connected to the line, since it only draws a tiny amount of current. The schematic shows that the circuit consists of no more than a series resistor, a bridge rectifier and a moving coil meter. The value of the resistor depends on the sensitivity of the moving coil meter. In his prototypes, the author used old VU meters that require 250µA for full-scale deflection. A resistor value of 390 kΩ appeared to be optimal for these meters. For a 100-µA-instrument, this resistor value will have to be increased to about 680 kΩ. The starting point, when selecting a resistor value is that when the telephone is not in use, the meter should deﬂect about 2/3rd of full scale. The amount of meter deflection indicates the three different states of the telephone line: 1. The deflection is very small: the line is in use (voltage 5 to 12 V). 2. The deflection is 2/3rd of full scale: the line is not in use (voltage typically 48 V). 3. Full-scale deflection: ring signal (60 to 90 V AC). Because the idle voltage and certainly the ring voltage are high enough to be dangerous, it is recommended that the circuit is constructed in such a way that it presents no hazard when touched.